Been pretty busy the past few days. My fiance is coming to town and I’m pretty sure she wouldn’t appreciate the way my living room has been transformed into a workshop. I’m pushing hard to finish the first foam core prototype and get things somewhat cleaned up by the weekend. Yesterday, I was able to get the Foam Core lined. Today I’ll be cutting Flex Iron (Magnetically receptive material) and placing it at regular intervals on the base. I have a huge roll of Flex Iron and a shiny new swing line paper trimmer to accomplish this task. The first step is to cut the Flex Iron into manageable pieces. My paper cutter is only 12″ wide and the Flex Iron roll is 24″ wide. So first things first, I cut a few 24×12″ rectangles from the roll using a razor blade. 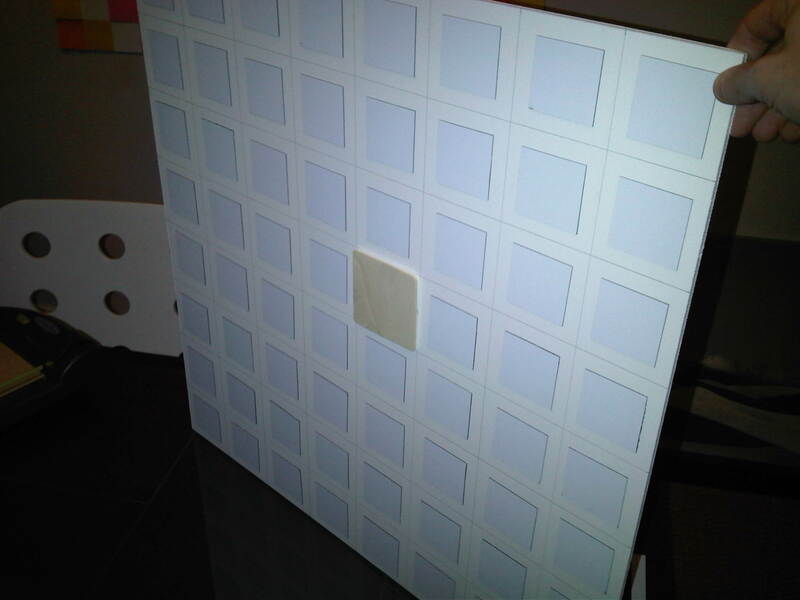 Next, I lined the 12×24″ rectangles using a ruler and my handy foam core strait edge. Every 2″ I drew a line. 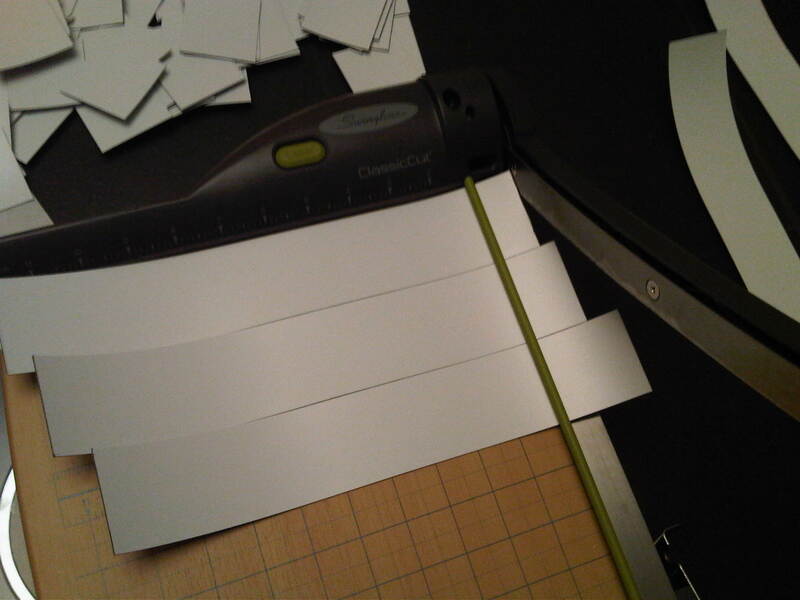 Then using a the paper trimmer, I cut the rectangle into a bunch of 2×12″ strips. 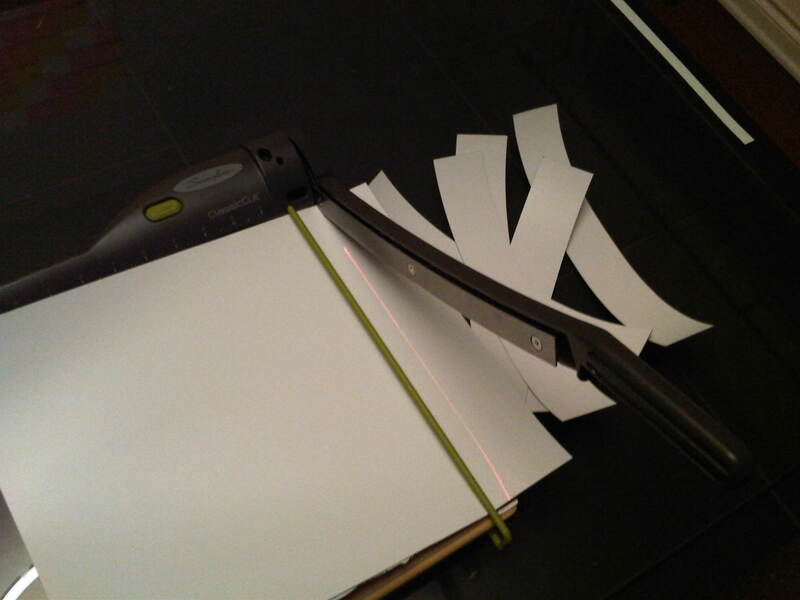 Finally I get to really exercise the paper trimmer. It took a little practice, but I eventually got a system going. 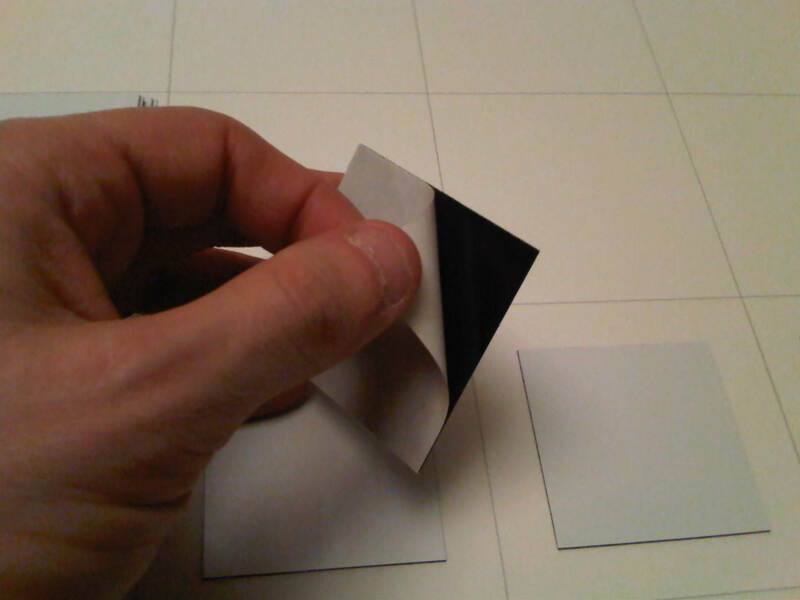 I made relative short work of the strips – reducing them to 2×2″ squares. Now for the fun part. 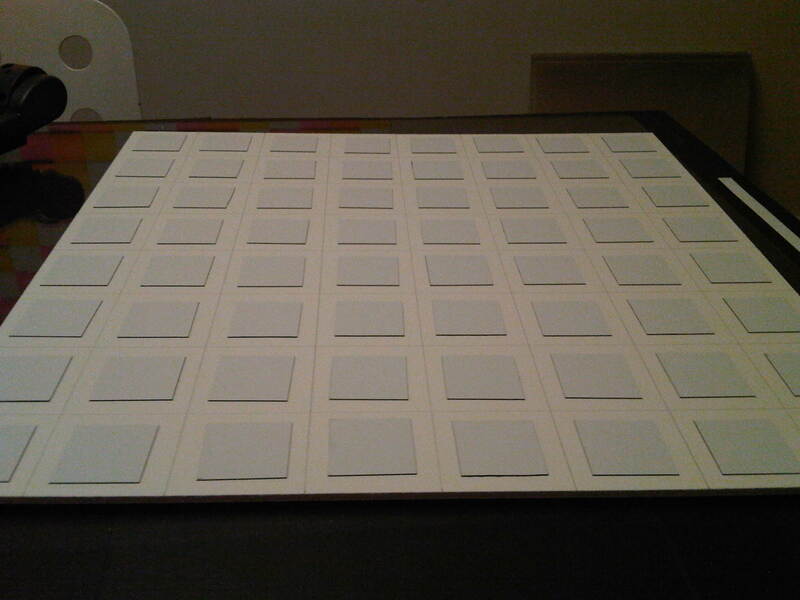 I began the process of peeling of the Flex Iron backing and sticking the 2×2″ squares on every 3×3″ square on the 24×24″ foam core base pieces that I lined the previous night. This took a lot longer than I was expecting. The adhesive works really well, but constantly peeling off the backing grew tiresome. After I finished the first 24×24″ foam core base, I decided to put it to the test using some of the wood peices I had laying around. Success! The magnetic strength was nearly perfect. A great (unplanned) side effect of using magnets that were smaller than the tile is that when I push down on the corner of a tile, the opposite corner pops up. 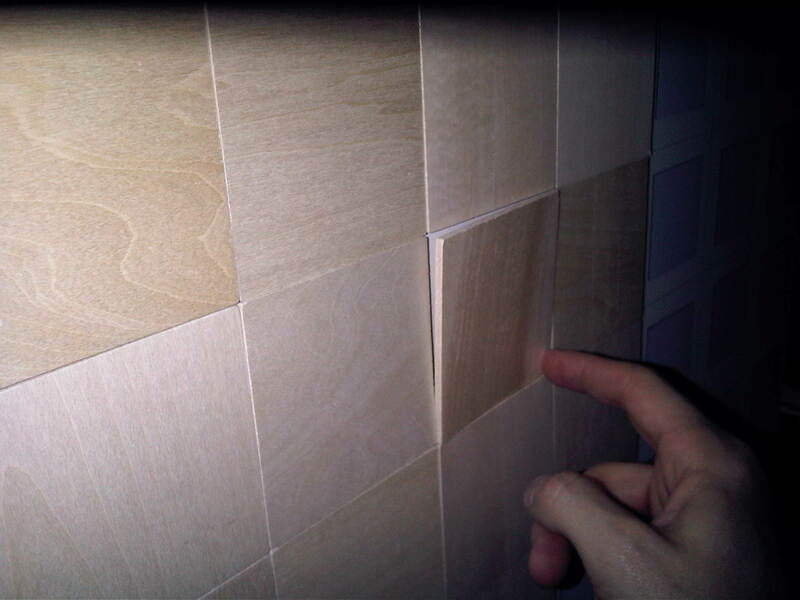 This means it should be easy to change single tiles in a mosaic without taking the whole thing apart. I was pleasantly surprised how well these tiles stuck. 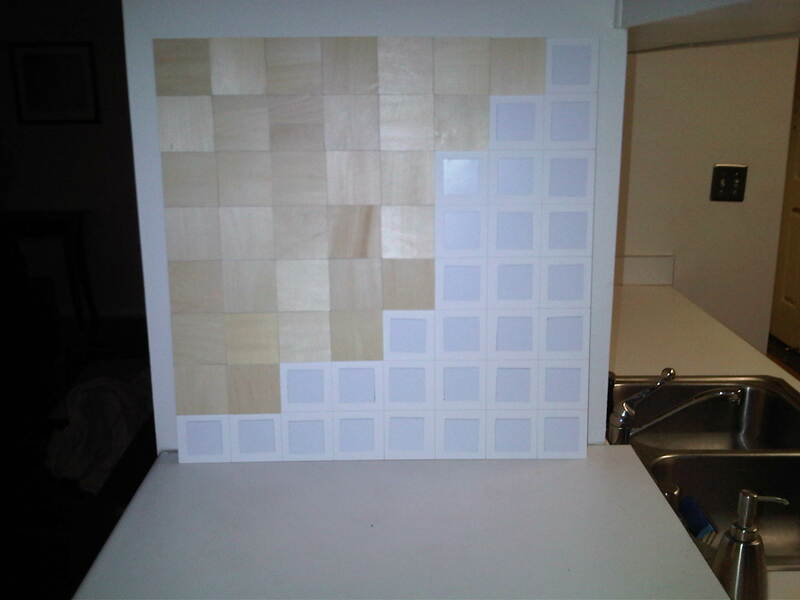 This entry was posted in Mosiac Project, Prototype 1, Uncategorized and tagged 8-bit art, FlexIron, Prototype 1, Wood Tiles. Bookmark the permalink.